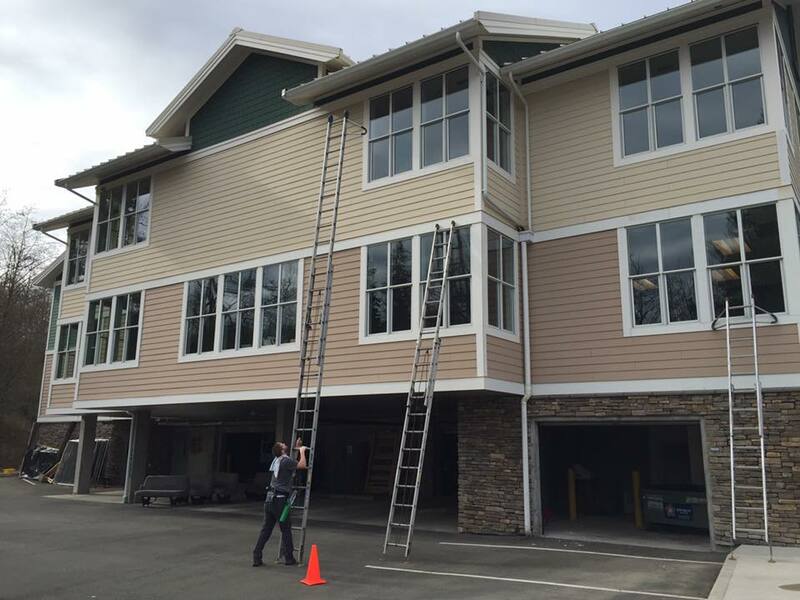 At Apex we use top quality window cleaning products, utilizing the latest techniques and tools. Our soap is our own mixture, which is designed to leave your glass shining and dust resistant. We clean window tracks (vinyl only), window screens, and storm windows. Before entering your home our equipment is cleaned. We have a Shoe’s-Off policy while working in your home. Drop clothes are used when drips are considered a hazard. Here at Apex we have developed a preventive maintenance strategy that will help extend the life of your gutters and roof. We have three cleaning services dependent on your cleaning needs. Apex strongly believes that pressure washing takes valuable years away from all types of roofs and therefore we do not provide this service. 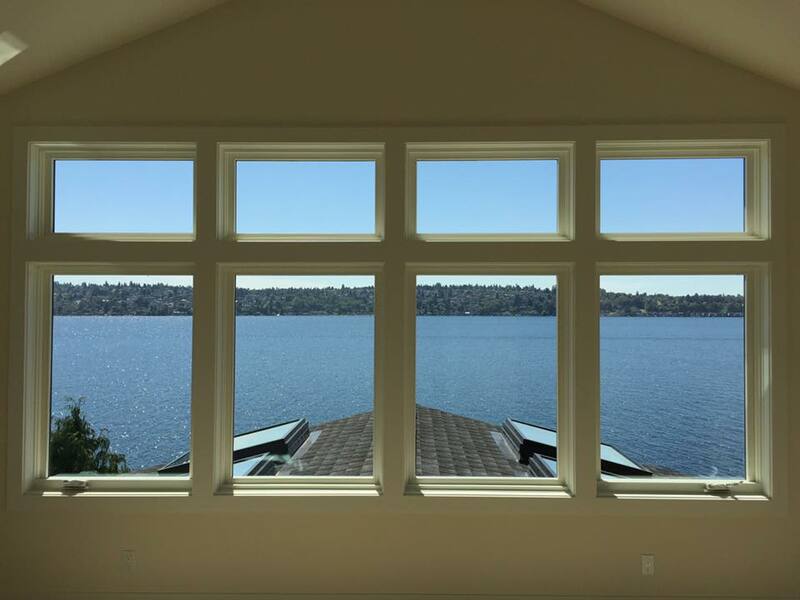 We use a specifically designed formula for use in the Pacific Northwest. We recommend moss treatment to be applied at least once a year for minor moss growth and 2-3 times a year for heavy moss development, with the optimal time being late spring/early summer. Our formula is a sprayed on liquid application, with fast acting results, that will not discolor metal or painted surfaces. Moss treatment also combats algae, mold, and mildew. 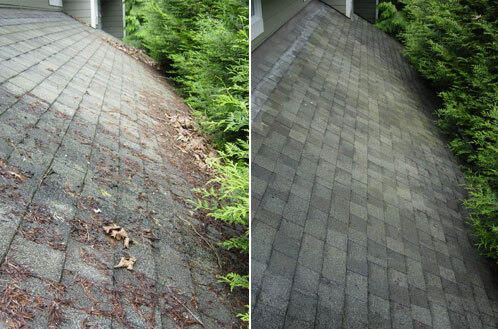 The moss treatment can be applied to composite, cedar shake and most tile roofs. We have been trained with rope and harness gear and will safely apply treatment. 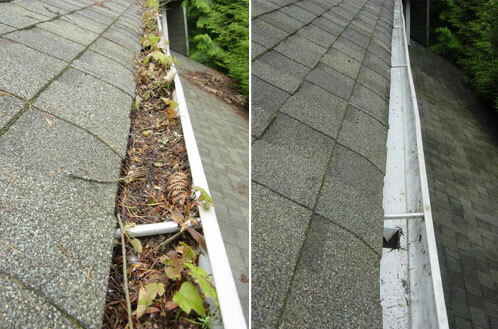 Gutter Cleaning: Apex will remove all debris from your gutters by hand, ensuring the downspouts drain properly. Any debris that falls to the ground will be cleaned up, and if needed debris can be hauled away and recycled. Roof/Gutter cleaning: Apex first blows off the roof to clear debris. Roof valleys are cleaned thoroughly. Gutters are then cleaned, ensuring downspouts drain properly. Roof Moss Treatment: Apex first blows off the roof to clear debris. Roof valleys are cleaned thoroughly. Gutters are then cleaned, ensuring downspouts drain properly. A roof moss treatment is applied. Apex can repair leaky gutters and downspouts. We also have added downspouts to homes where poor drainage caused many headaches. 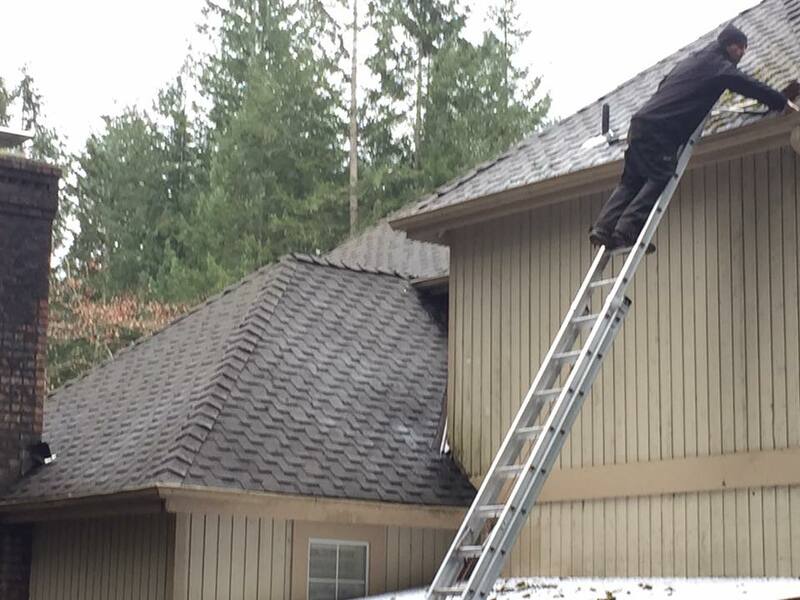 Loose gutter spikes are hammered back in with the basic gutter cleaning service. 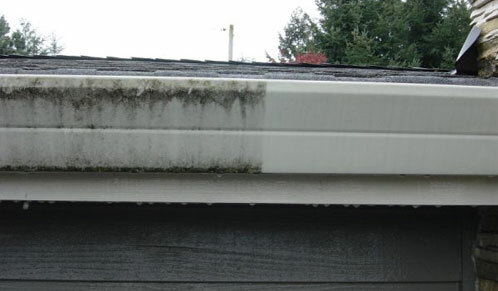 The exterior of your gutters get dirty over time. Green and black mildew/algae grow and discolor the painted surface making your home look dirty. 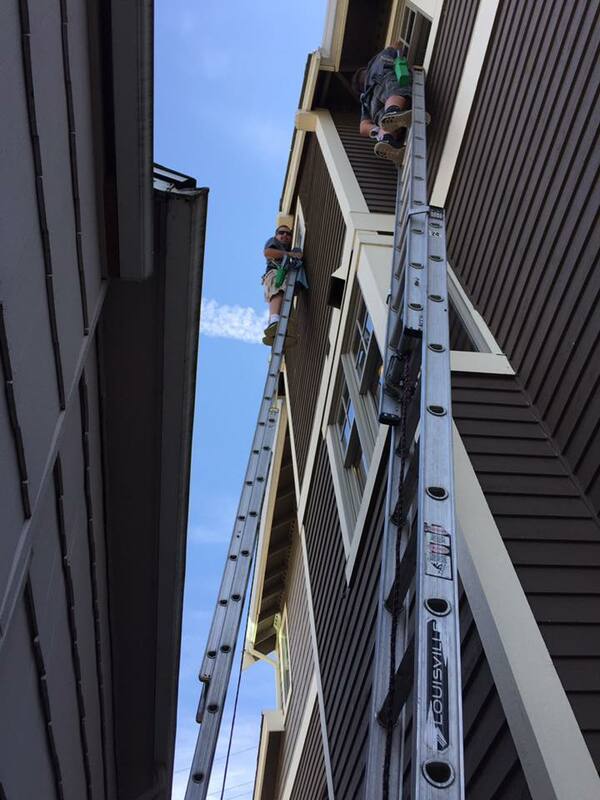 Apex has two methods for cleaning the exterior of the gutters. By Hand: Using a cleaning solution and a brush, the gutters are cleaned and rinsed. This method works well on painted gutters where the possibility of paint coming off is a potential. By Pressure Washing: This method is more intense and recommended in preparation for painting. Our first priority with pressure washing is to protect your home. Apex trains its staff to be fully knowledgeable in how to best pressure wash the different surfaces of your home/business. We have invested in top notch equipment that will clean Driveways (asphalt, concrete and pavers), Patios, Decks, Docks, Exterior of gutters, Retaining walls (stone, brick, stucco) Home Siding (wood, fiber board, vinyl, etc.) and Sidewalks in a quick and complete fashion. Apex strongly believes that pressure washing takes valuable years away from all types of roofs and therefore we do not provide this service.